ON SITE is a form of community composting designed for people who live in condos, apartment buildings, and multi-unit dwellings. We partner with the good folks at Urban Eatin’ Landscapes to set you up with a composting system at the location of your residence, providing you with the training and resources you need to maintain your bins. The setup costs for ON SITE are covered by our incredible funders listed below. All you need to participate in this project are an agreeable building owner(s), volunteers to maintain the bins, and residents who are enthusiastic about the option to compost on site. If your building meets these requirements, we want to hear from you! Email compost@greenactioncentre.ca or call 204-925-3777 ext 106 to let us know you’re interested. Looking for a How-To Guide? 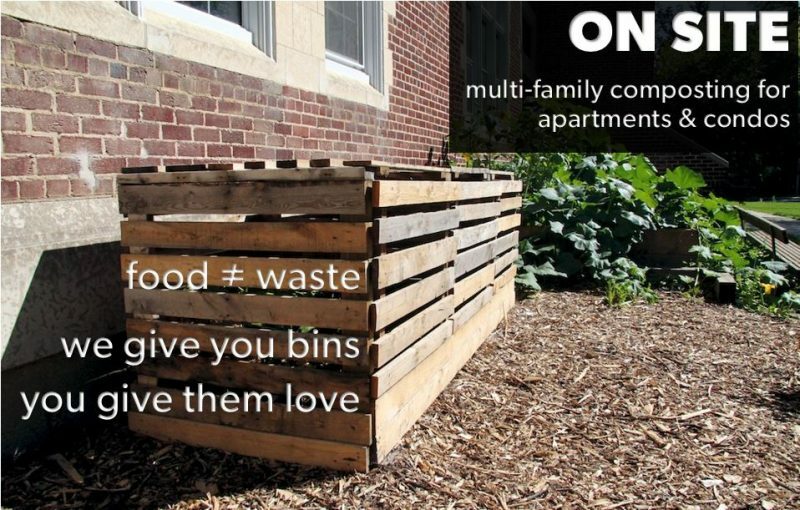 In the pilot year of this project, we created a how-to guide for multi-family composting. Whether you’re participating in ON SITE or want to participate, or just interested in striking out on your own (perhaps you live outside of Winnipeg and want to bring this to your city! ), visit this page to download our free resource! Want to Know More About Sustainable Condo Living? Check out our Zero Waste Condos blog series! Zero Waste Condos: Where are We At? For inquiries about the ON SITE Multi-Family Composting project or questions about the state of your compost bin, call 204-925-3777 ext 106.